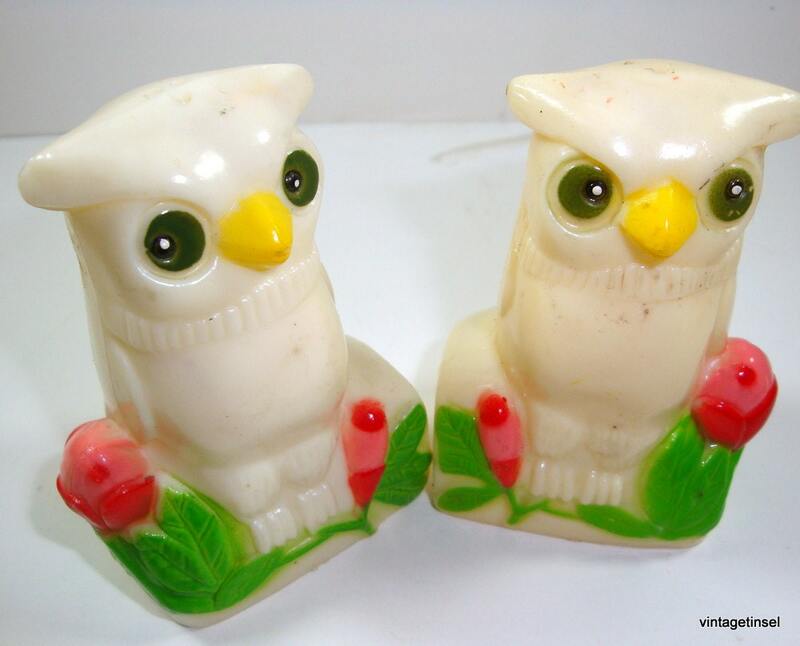 Vintage owl salt and pepper shakers in a hard plastic. Green life like eyes. One owl is darker than the other. Owls are darker than shows in photo, more of a creamy white instead of bright white. Bottom screw opening will turn, but I am unable to get the stopper out. Otherwise in good vintage condition. Measures 3" tall. Bottom is marked H.K. which I assume means made in Hong Kong. Very collectible plastic shakers! Questions? Please ask! Your idea of acceptable vintage and mine may differ. These could use a careful light cleaning. As noted above, there is a color difference between the 2 shakers. More salt and pepper shakers? I'm happy to combine shipping.